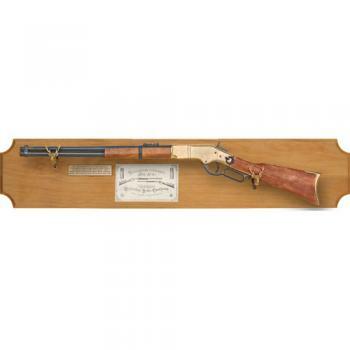 1866 Old West Carbine on Board Display [27-400] - $262.00 : Metalcraft by Blair - military gifts and memoribilia. This famous lever action rifle was known as "The Golden Boy" because of it's shiny brass receiver. Mounted on a 45" wood stain frame with buffalo head hangers and brass identification plaque. Frame Size: 45" x 9.25"